I have been a CCIE since 2008. Every 2 years, I’ve gone through the process of re-certifying in the same way: I take the routing & switching written exam until I pass it. I have friends who like to pass a different CCIE written exam for the variety and knowledge expansion of studying another technical specialty, but I’ve always been too busy to be willing to make that work. Most of my IT career I’ve had at least one job as well as a side hustle. Studying something other than routing and switching just for the variety hasn’t been something I was willing to take on. Besides, routing and switching is where I’ve spent much of my time. 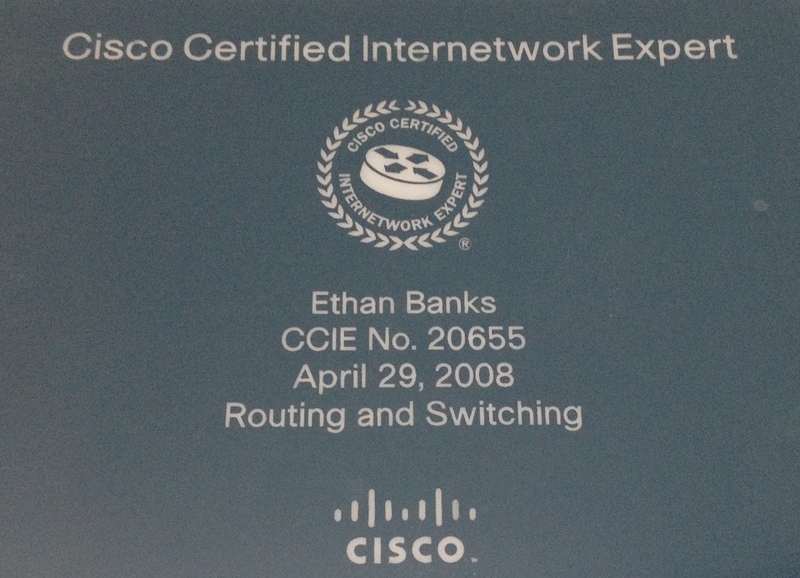 The last time I re-certified, it took me three times to pass the CCIE R&S written exam. While that exam is a challenge that many people fail to pass the first time out, I felt like I was getting rusty on some fundamentals. Three times was not the end of the world, but the effort felt forced. I wanted a refresher. Refreshments served from the firehose. Bon appetit. Now that my next re-certification cycle is upon me, I opted to refresh by spending ten days with Narbik Kocharians, whose bootcamp was helpful in my lab attempt back in 2008. While I did many hours of the lab work that most of the students were eager to conquer in preparation for their lab exams, I focused chiefly on Narbik’s lectures. The big idea for me was not to bang around on the CLI, which I’m still adept at. Rather, I wanted to review the major CCIE R&S topics, Narbik-style. Yes, CLI is helpful, and I still do that sort of work. But sometimes you just need to recall the intricacies of how EIGRP variance works, review what the OSPF LSA types are, remember all the things about RIP you forgot because you rarely see it in real life, and contemplate NBMA behavior in a DMVPN cloud. Narbik is a full-time CCIE instructor, and his company, Micronics Training, is part of the Cisco 360 program. Narbik has a close relationship with Cisco, and was one of three co-authors on the current CCIE R&S v5 exam guide published by CiscoPress. Narbik knows his material very well, and he hones his lectures constantly with new information, lab findings, IOS quirks, and real-world anecdotes. Plus, he wastes no words. As in, if you miss a paragraph or two because you decided to check Twitter, there’s a decent chance you’re lost until he changes to a new topic. A Narbik lecture is not just drinking from a firehose; it’s drinking from a firehose that’s on full-blast, delivering relentlessly until Narbik is done. There are no lecture breaks. There is no repetition of big ideas. You listen. You digest. You write constantly. You get what diagrams you can. You do the CLI commands he is dictating to you off the top of his head in real-time illustrating what he’s teaching. You focus utterly, or you miss out. And you better have done your studying before you show up in the class. If you think you can show up to this bootcamp cold and just “get it,” you’re kidding yourself badly. Most of the lectures will go over your head unless you are already well-grounded in the CCIE blueprint topics. For me, a Narbik lecture is the best thing in the world. I was that kid in school who was bored after 10 minutes of class because the information came too slowly. I would “get it” quickly, and often read ahead in the book to predict what the teacher was about to go over next. It was a game to keep myself entertained because school just didn’t move fast enough. There is no “slow” with Narbik. If your mind is always in overdrive, jumping from thing to thing because nothing moves quickly enough to keep you engaged, Narbik is your instructor. Over the 10 day bootcamp, I was able to hear the following lectures delivered by Narbik. This isn’t everything that’s on the CCIE written blueprint, but it is a sound list of core topics. I took thousands of words of notes, accompanied by hours of audio using Microsoft OneNote. Was it worth it? For me, I found the refresher to be invigorating and worthwhile. From a technical perspective, I think I needed it more than I even thought I did. Even if I wasn’t re-certifying my CCIE digits, sitting in that classroom was an excellent experience. Now, onto the fun job of diligent studying, augmenting my notes with documents from cisco.com, and making it through the exam. Me with Narbik in October 2015. I can’t explain the look on my face. It’s just weird. CCIE written retake policy updated. If you are engaged in the CCIE program, I noticed the following on Cisco’s CCIE/CCDE written exam policy page. Effective October 1, 2015, the following policy will no longer be in effect: Candidates may attempt any CCIE or CCDE written exam up to four times per rolling calendar year. Candidates cannot retake the same written exam more than four times per rolling calendar year regardless of passing or failing the exam. This is encouraging to me, as (depressing though it is to contemplate) it’s entirely possible to fail that exam four times in a row. I’m not planning on that happening to me, but being limited to four times in a year was disconcerting if your CCIE status was at stake. Now, it appears you can keep throwing $400 at Cisco as many times as you care to, assuming each attempt is 15 days after the last one. I don’t write about certifications very much these days, because I’ve lost interest in most of them. But here are a few other points I’ll raise about certs for those of you who still are compelled by them. Yes, I’ll be pursuing CCIE Emeritus status if/when Cisco makes that available to me sometime in 2018. I don’t spend much time at the Cisco CLI these days, working more with a multi-vendor range of technology. While many take their CCIE’s further than I have, becoming double, triple, or more CCIEs, that doesn’t make sense for my specific career. I’ve already achieved what I personally wanted to with the CCIE program. There is no doubt the certification changed my life, but I’m heading places now that the CCIE can’t take me. The CCDE program is still interesting to me, but I find the focus on service provider and very large enterprise technologies a disadvantage for me. Lots of work to get through the study, and I lack sufficient motivation to make a go of it right now. I still believe it’s a great program. Maybe I’ll get back to it someday. The ONF has launched a couple of SDN related certifications. They don’t look overly difficult, at least at a glance. I’m thinking of giving the ONF Certified SDN Engineer exam a try completely cold to see what I’m in for. Then I’ll pursue a course of study to fill in my no doubt many weak areas. If I do try it, I’ll pass along what I can without betraying the integrity of the program. Disappointed to read you decided to hold off on the CCDE. I talk to a lot of people in the industry about it and the recurring theme CCIEs tell me is that they don’t work in a large enough company that warrants it. I recently wrote something about where the CCDE and CCAr fit using a real world example . As I said, I believe CCDE is an interesting and valuable program, but at the moment, my focus is on running a small business which is already more than I can handle most days. While I love acquiring knowledge, it’s awesome. Maybe best thing ever. The problem is: never in my life have I met someone with a CC** or MS** or whatever actually learned something substantial from cramming for these exams. The people I think are worthy of such a certificate were knowledgeable before that. And a lot of time you still see people who have some certification but they are still useless. Recently had one of those when I needed something fixed. The worst part is: for an outsider all certificates from the same company look the same. There are certificates who people should value better than others, but most outsiders have no idea which those are. So for the outsider the certification isn’t of much use. My take is that you get out of it what you put into it as a candidate. Back when I did CCIE, I studied and labbed for over a year before I attended a bootcamp. For my purposes, the bootcamp was intended to knock off some rough edges and apply polish to the dull bits. When I did MCSE many years ago, I didn’t cram, either. I spent several months watching training videos, labbing, and studying. I view certification as a means to an end, but the end is not certification or passing exams. The end is to gain a much deeper understanding of the technology in a way prescribed by the vendor. None of that takes away from what you’re saying, though. Unfortunately. It’s a part of the reason I’m losing interest in certifications in general. I still see certs as a useful way to learn. But I also recognize that certifications continue to lose credibility for many of the reasons you cite, as well as many others you don’t. Yes, knowledge, or better yet with experience is where it’s at. You need both to be productive. With the right bootcamp you’ll get very good training. My personal preference would be for only the ‘hard certificates’ to exist. Call the easier ones courses or something and don’t give out certificates for those or some give it some completely different name. Funny enough. I’m going down a very similar path. I hit emeritus a couple of years ago and I’ve never been happier not having to play Cisco Trivial pursuit anymore. :) Speaking seriously, achieving my CCIE changed my life. It let me find employment at two vendors. Opened up relationships with a bunch of great technically people, etc… I seriously looked at the CCDE when it first came out, and although I believe in the value of the cert. It just doesn’t fit in my career goals right now. The ONF certifications are interesting for sure, but I”m more focused these days on learning coding skills. Certifications were incredibly important to get me where I am, but I’m not convinced they are the best way forward to where I want to be. Honestly, I think that’s one of the things I love about this industry right now. 10 years ago, you got a CCIE and then you were smart. Now, you get a CCIE and have to decide which of the 100+ paths available is the right one for you to walk down at this point in your career. RE: coding. You’re making a key point here, which is that of focus. Can’t do all the things. Have to pick some new technical skill to go after and stay focused on it, or the skill will never be gained. Focus comes with passion and desire, and that’s where I’ve been falling down lately. No one thing I want to accomplish has risen to the top and overshadowed the others. @NetmanChris: when you say coding what exactly are you refferin to? Network programming as in writting network applicatons or Network programming which is rather scripting for Network Automation ? My CCIE written certification expires on March 3, 2016, I do not think I can make the laboratory before that date. To renew the certificates again when I have to go back to the CCIE written exam? Ruben, here’s the official policy from Cisco’s site. If that doesn’t clear it up for you, then be more specific in your question, and I’ll do my best to help you find an answer.